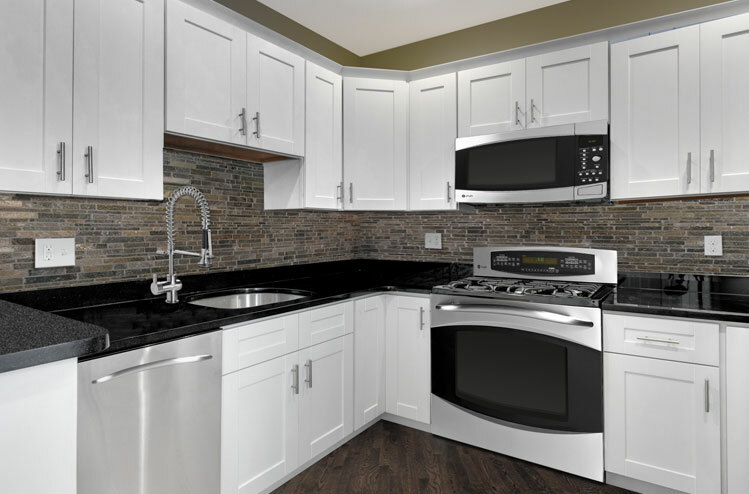 We get it– waiting to sensibly budget for some beautiful new kitchen cabinets is a pain. If you’re champing at the bit to get your kitchen redone, it can take all of your patience to keep your wits about you. Everyone wants a home filled with beautiful decorations. Furthermore, everyone wants to dazzle their friends and family by making them wonder how in blue blazes you managed some great décor element. Adding personal flair to the kitchen or elsewhere in the home on a shoestring budget feels great. The expenses involved in home decoration improvements have slowly become ridiculous. We’re a bit spoiled by the decoration jobs we see on TV or in fashionable magazines; most of the projects in them actually amount to thousands of dollars in costs for fairly limited impact. We don’t think it’s out of the question to want your home to bear your beautiful signature without having to declare bankruptcy to get there. If you’re stuck for ideas about how to proceed, we have got the solution for you. Down to the good stuff! We have compiled some very cool and inexpensive DIY projects for home beautification into bite size chunks for easy consumption. They look great, they’re simple and easy to accomplish, and most important of all they won’t sideline your new kitchen remodel budget. Furthermore, these are great projects that can contribute to your family bonding time.We made sure to include projects that even a DIY amateur could appreciate and not feel intimidated by. For the experts out there, you know as well as we do that every new craft and flair in your home improvement arsenal is valuable. Being able to stay creative and make refinements a couple of times a year keeps the home feeling fresh and revitalized. Have a look through these and discover some that fit with your artistic style. Mix and match ideas if you enjoy an eclectic aesthetic, or stick to one and really nail it. The DIY world is your oyster! With so many options available, though, there’s no excuse not to add some cool new home decorations while saving your money for bigger remodeling projects. 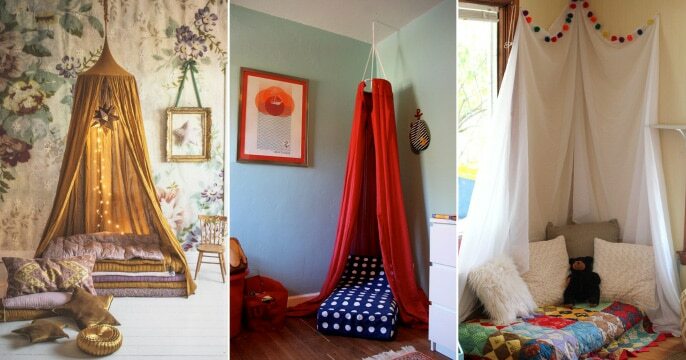 Use a curved curtain rod along with some relatively cheap curtains (how cheap is up to you) in order to convert a corner into a comfy reading nook. With only a single piece of cardboard, you can add a very cool Moroccan-looking theme to your wall or walls. If you aren’t crazy about it or later want to modify it, it’s as easy as painting right over! Putting together some of your very own custom shelving is incredibly simple. 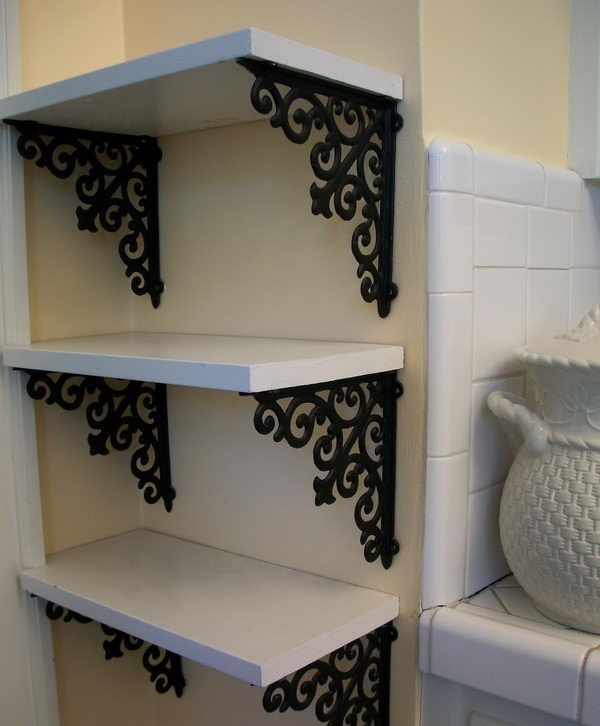 You’re only going to need some hobby lobby brackets along with a piece of wood. The style of wood (along with how you choose to paint or finish it) can match the tone of any room or other accessories. For a method so simplistic, this one has got a lot of style mileage. 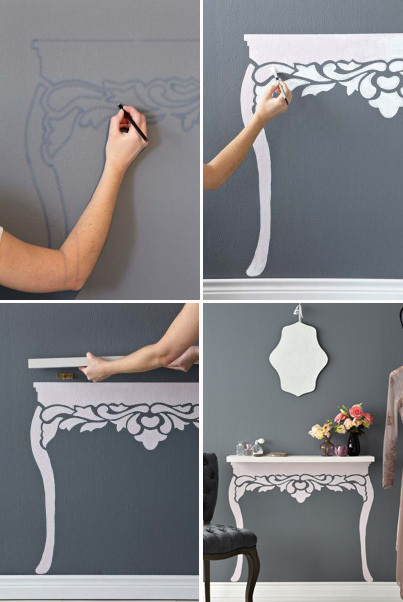 Placing a floating shelf on your wall and then using a stencil to accentuate it with an antique table motif looks positively amazing. Headboards, particularly those with serious style points, can weigh a ton. Difficult to move and prohibitively expensive, you can be left wondering WHY DO WE DO THIS TO OURSELVES. 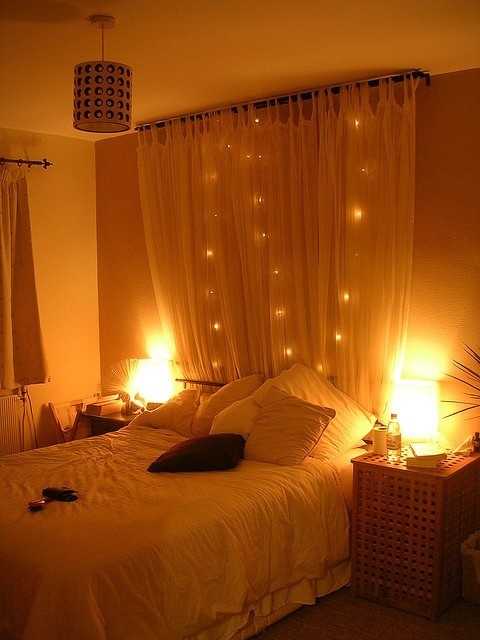 Instead, just install a great curtain rod above your bed and hang some lavish curtains. 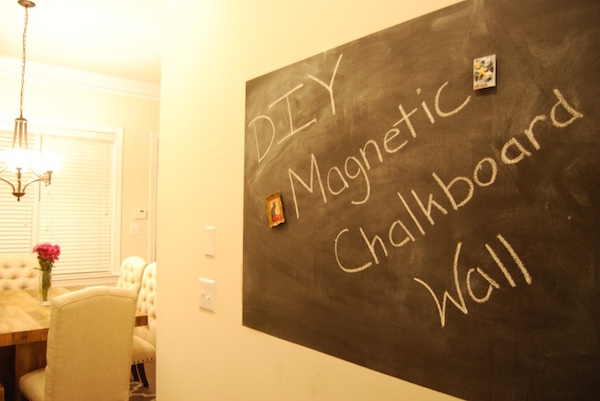 If you have a spot on a wall that you would like to accent in a fun way, consider putting up a chalkboard. These items are becoming trendy even in adult homes with no children due to their versatility and their spirit of play. If you get one that’s magnetic as well, you have even more room for creativity by adding other attachments to it. If you are feeling a little bold, this tip can give you a ton of options to cover wall space with cool new accents. 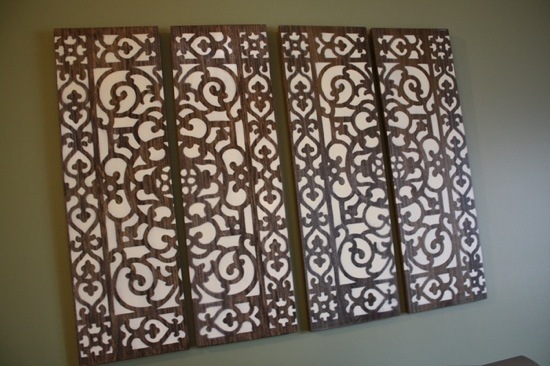 Take a slender bit of wood or even canvas, and use your (or pick up a) ornate door mat for a stencil. 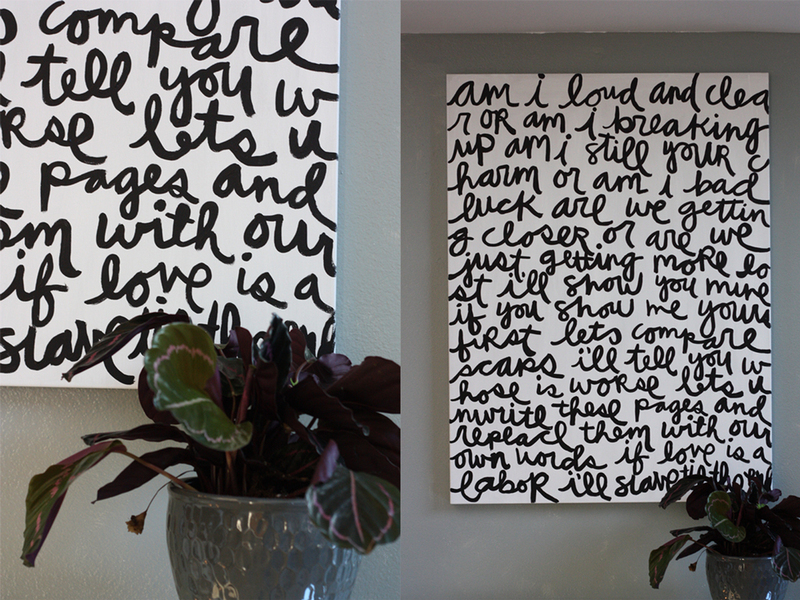 Spray paint over and voila: you’re left with one or more slick new pieces of wall art. Whether you’re a fan of antiquing or have some great contemporary frames you’d like to expand your use of, frame shelving is a fantastic option for repurposing these items to create excellent wall decoration. 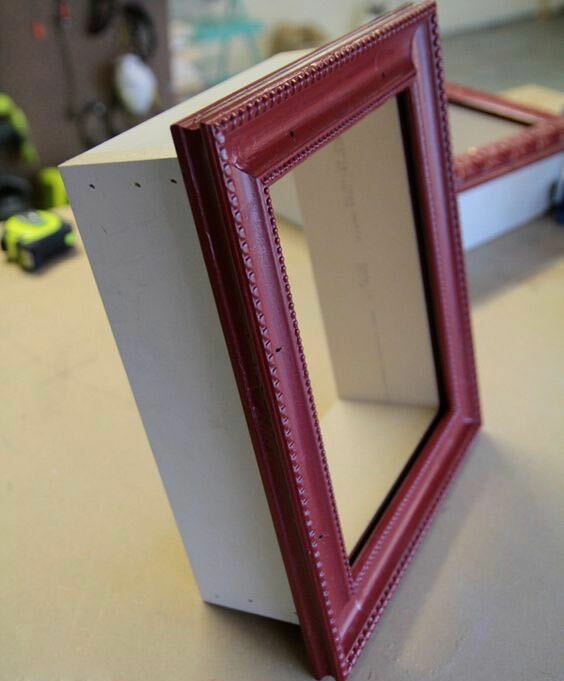 Start with some cheap wooden shadow boxes and attach your frames to the fronts to create an appealing and unique presentation. 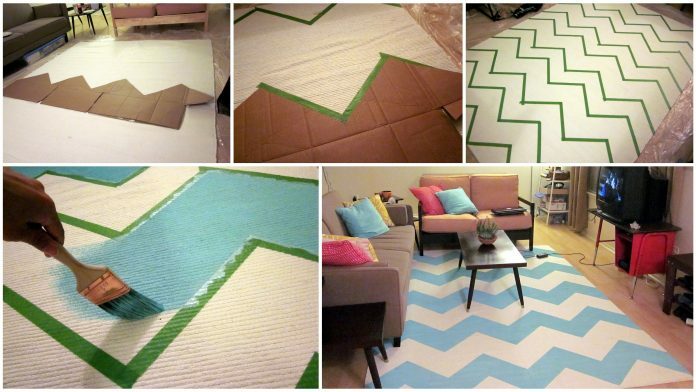 Here’s a cool DIY home craft with a unique look all its own. Install a slender wall mount that will be easily concealed by anything it’s carrying. For the bottom book of the stack, glue the back cover to the underside of the mount so that the mount is not visible from beneath. 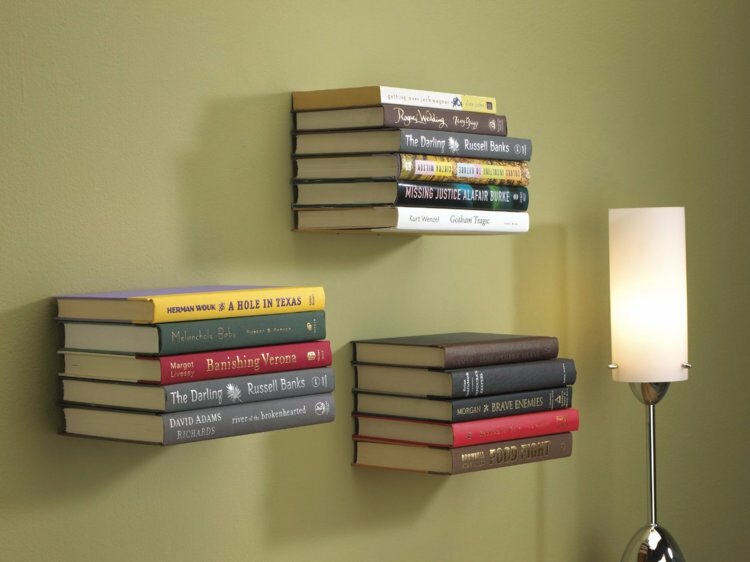 Then place a handful of books on it to create the pleasing illusion that the books are hovering in space! Visitors to your home will find it fetching to say the least. 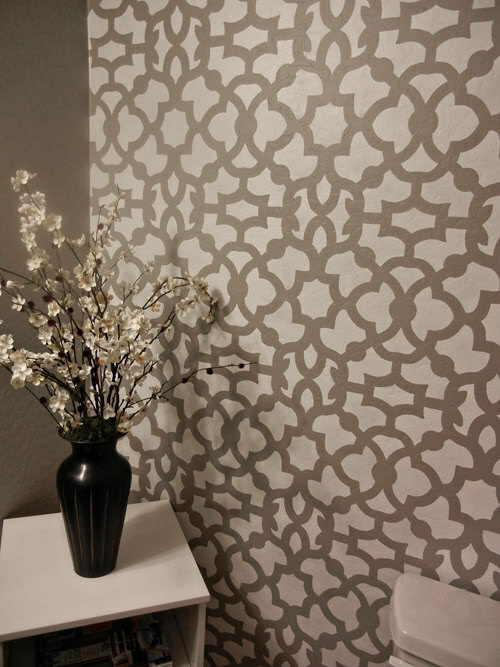 Turn a flat and boring wall into an artistic statement all your own. Stick with prose, or even add doodles to create an extra visual impact. Just pick up a cheap canvas and go. Lost for inspiration? Use a quote you like, or even song lyrics.